Apoquel is a fast acting and safe new treatment from Zoetis for the control of acute and chronic canine pruritis. Apoquel provides onset of relief within 4 hours, and effectively controls itch within 24 hours. It is safe for short term and long term use and can be used in combination with many other medications. Uniquely targeted to stop the itch with minimal negative impact on the immune function. Apoquel improved the quality of life for the dog and it's owner. 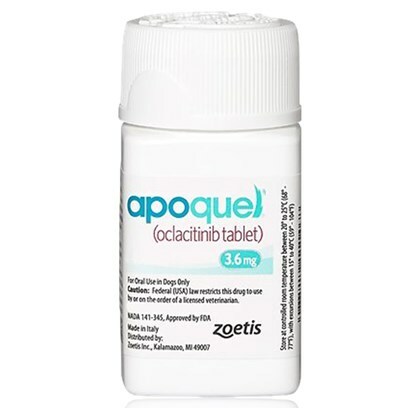 APOQUEL inhibits the function of a variety of pruritogenic and proinflammatory cytokines, as well as cytokines involved in allergy that are dependent on JAK1 or JAK3 enzyme activity4.